Ken Flynn was born in Dublin 1944. While still attending Wesley College, aged 16, he won the Caltex (now Texaco) Art Competition and was awarded a scholarship to the National College of Art, Dublin. During this period he spent time in the studio of his uncle George Walsh RHA, a painter, sculptor and international stain glass artist. In 1963, he had the honour of exhibiting in the window of Combridges Art Gallery on Grafton Street during President Kennedy’s visit. 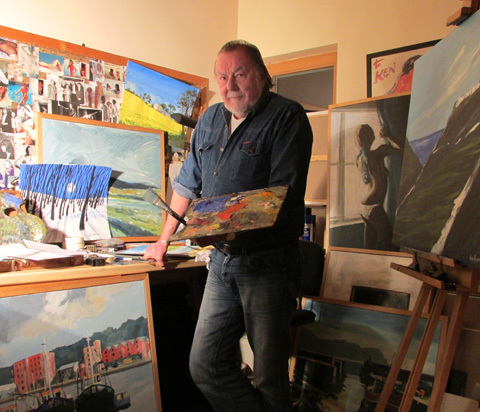 From the mid ’60s, he painted and exhibited on Achill Island for the next 15 years. He also painted extensively in many other parts of Ireland. From the late ’70s he began painting regularly in Greece, France, Spain & Italy. He has also worked in Mexico, Cuba, Tobago and and several other exotic locations. His work appears in in many collections worldwide.